Hello and welcome to another Tuesday Morning Sketch challenge. 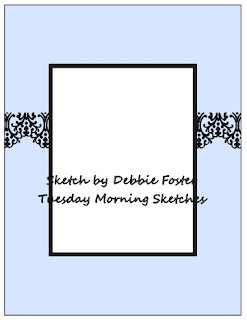 This week we're using sketch #431 designed by our very own Debbie and our sponsor is Pink and Main. It's a clean and simple design and I definitely took liberties with it this week by adding a sentiment panel across the top. The image was stamped at my friend's house and I'm not sure who makes it; likewise for the sentiment. I had one remaining piece of dsp that has wheatfields, so I used that along with a piece of burlap that was cut with a SNSS large scalloped die. I placed a dark brown mat underneath the border, and added a narrow strip of matching gold cardstock to the center. I had a piece of burlap left over, so I stuck it beneath the sentiment rather than waste it. It kind of looks like a heart, eh? Please be sure to check the Tuesday Morning Blog challenge for the creations my DT members have created for your inspiration. A super card Carol, a fun image and sentiment - your background is perfect, a lovely rustic feel. This is just too, too cute. I LUV it. The burlap is a perfect embellishment, and that image is adorable! Super cute and adorable card design. And, your coloring of the image is fantastic. Have a great rest of the week. How fun card! 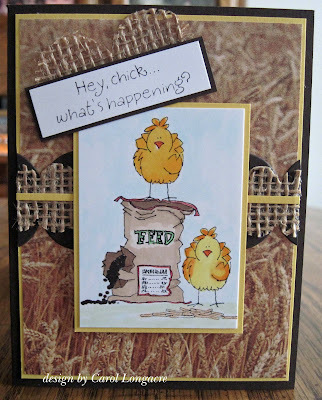 :D These chicks are so cute and such great rustic touch you give to the card with the burlap strip! Great recycling of your leftover, too, that burlap piece on top seems really a heart! I absolutely LOVE how you used the burlap. Your image is adorable and the sentiment makes me smile! I like the designer paper too, it goes so well. I hope to have time to play with the sketch this week. Have a good day. Really cute card. So very nicely done! What a farm fresh country card! Your take on the sketch is awesome. I'm not good at "taking liberties" like you are. Using the patterned wheat paper was perfect with the chicken feed motif...brilliant use of the DP. Also like the fancy cut to make it a 'border treatment'. Ditto the burlap heart. Great looking design, with pops of color and great texture. TFS & Hugs (and I liked your liberties too). Now that is just adorable! The burlap is a great touch. I believe you stamped that image here but I need to investigate to see the maker. Nice job! Super cute card!! I love all the "liberties" you took with the sketch!! Your card is adorable. 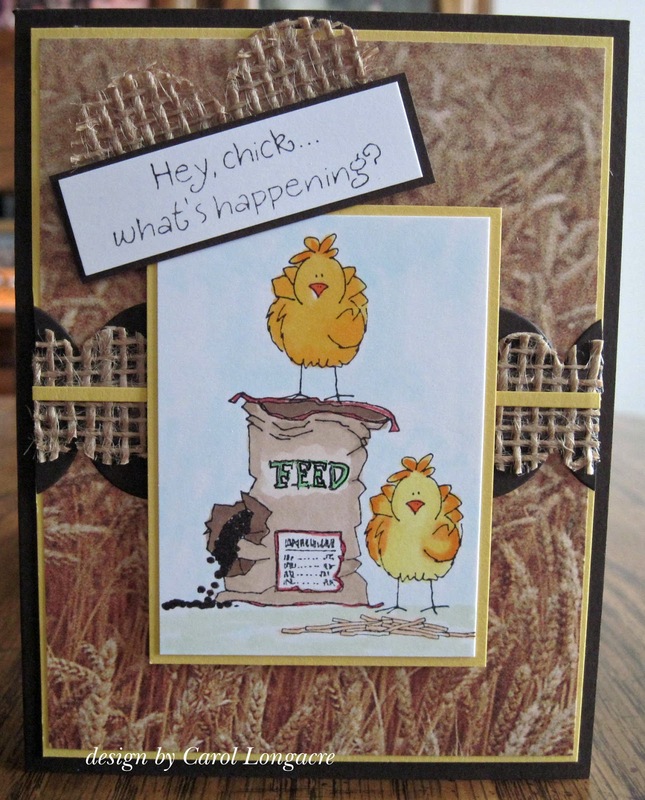 I love the chicks and the burlap accessories. Have a great weekend. Adorable Carol! If I had to guess I would say its a Inky Antics stamp/set??! Love the added burlap has such a country feel. Love this card. The image is adorable and then combining it with the burlap is perfect. Feels so country.